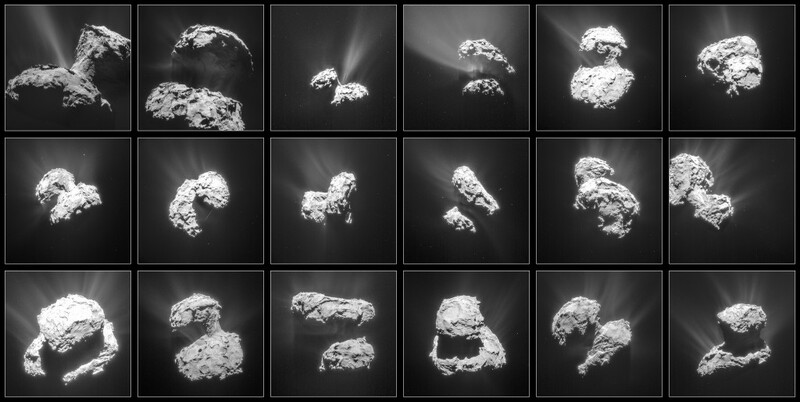 Today’s CometWatch entry is dedicated to Comet 67P/C-G’s activity – this stunning montage of images is showcased as our ‘Space Science Image of the Week’. The images cover the time period between 31 January (top left) and 25 March (bottom right), when the spacecraft was at distances of about 30 to 100 km from the comet. 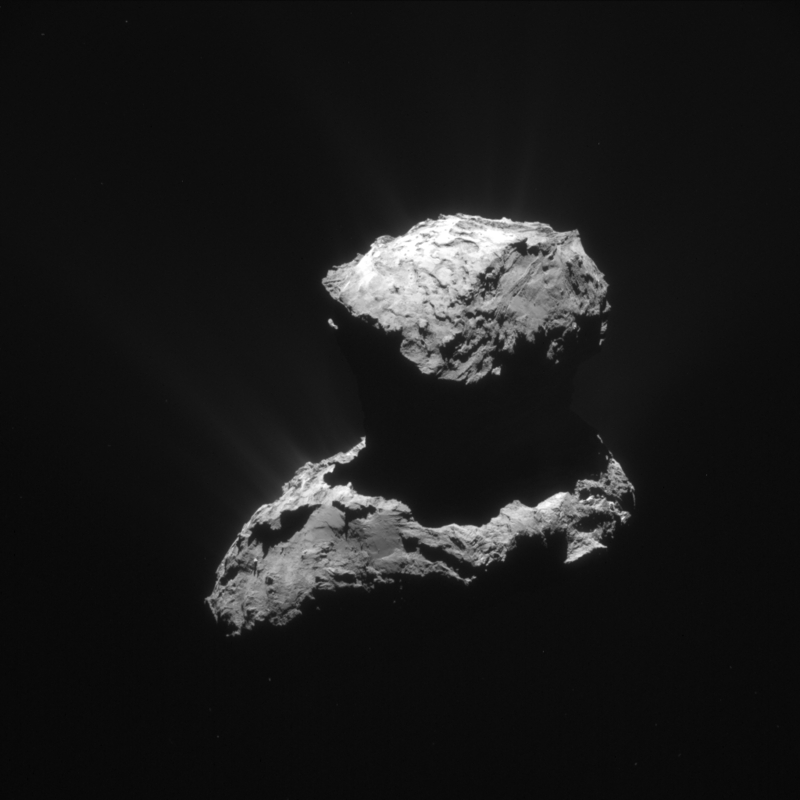 The final frame is also presented as today’s CometWatch. A high resolution PDF version of the montage can be downloaded here. The first photo to show the south pole with both head rim and body rim illuminated shows matches between the two. As usual, this comes as no surprise at all in stretch theory. I’ll just link the annotated photo. The blog has moved three stages on from actually proving stretch and is now detailing the complex jumps of the shear line from stratum to stratum, displaced rocks and morphological structures common to both lobes. New matches are purely academic. That attempt at linking just the photo didn’t work so here it is in a different link. Incredible what you have done and love following your blog! It looks to me like the neck is not only “stretched” but also “risen”?…or expanded like a baking muffin? Or a growing mushroom? Seems crazy but isn’t the density like ash or something? Very strange indeed! I too wondered if there was a bit of expansion. Seeing as the comet is already 70-80% porous, while being subjected to up to a few tens of pascals of pressure I suppose the neck could have expanded a little as it was heaved ‘up’. It came from a position where it was under pressure, to a position where it was under somewhat less pressure. The pressures are tiny compared with the Earth but there’s still a difference. Also, if it’s made from lightly sintered ice/dust marbles as they suspect, it would increase the scope for expansion due to the equivalent of changing to a different sphere-packing regime. That’s just a guess but I only just thought of it due to your muffin suggestion! All I see is randomness, no evidence for matching. Did you countercheck your method with unrelated or twisted areas? I’ve checked for a matching after the first good images of 67P/C-G became available, but didn’t find any significant match, just similar topographic elements which could be made matching in many ways. Have a good look and show me just *one* other way to match. Then move to a *constrained* point, that is one that is the same distance on the two new places that you are matching and find another match. Then repeat. It is the number of *constrained* *consecutive* and *spatially interrelated* matching points that makes this set of matches conclusive, not the mere fact that many random features can find similar and perhaps mirrored features elsewhere. Think of coastlines and how they relate to continental drift. Or the number of “points” required for a fingerprint match partial or complete. The west coast of Africa is constrained to look like the mirrored version of the East Coast of South America. No such random coastal matches happen when coasts are not related. These matches tell us that the comet stretched, and that there is little to no erosion/ remodelling at least in those vicinities. The twists and turns do get matched as well (I assume you mean in the third dimension by swinging the viewpoint round by 45° or 90°). 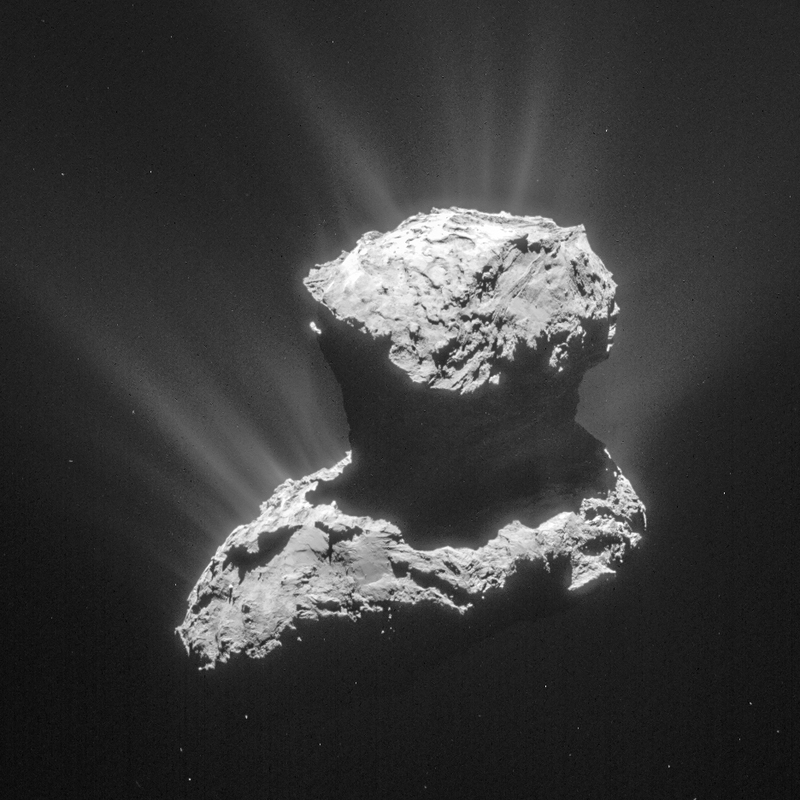 This Rosetta blog post picture is a case in point. In the linked, annotated version (from my Part 19), you can see a line running from the left of the frame (green dots) to the ‘corner’ of the head (orange dots). That exact same line is matched up in Part 17 from a different angle, almost 90° lower and yet it still matches. The Part 17 version can’t see any curving round towards the corner as can be seen in the Part 19 photo. That’s because the perspective of the curve is into the frame in Part 17. It’s across the frame in Part 19 and still matches. Furthermore, just to be exhaustive on checking the twists and turns in the third dimension, this same line was analysed in my comment near the top of “Around Anubis and Atum” (27th March 2015). The viewpoint was mid way between the other two. That time I described the matches in words, not with an annotated version. I emphasised at every stage that if you measured back from each newly described match point to the start point on each lobe, the aggregated distances would be virtually identical. I doubted that anyone would follow all the instructions, using a ruler or software to verify it but if you did so, as I did, you would see that this third viewpoint also constrains the matches along this same line to within about 3% on most of the aggregated measurements. Seeing as there are two 90° turns along the line in one plane and a slender 30° curve in a roughly orthogonal plane, it follows that the three analyses from three different viewpoints are accomplishing the same sort of thing as bending wire along the two lines and then removing them and looking at them from three different angles. The OSIRIS shape model software could probably do this very easily and even seat the two ‘wires’ together as well. Better still, it could just cut the entire neck out and seat the head lobe on to the body to see the matches that go all the way round (except for the stretch alongside missing slab A). There’s also a very significant 3D match in Part 5. For that match, the plan view matches had already been made and then I trawled for viewpoints that caught a stepped-down section from the side, a 90° swing. It was one of the best matches of all, yet it was constrained to be exactly in that spot and nowhere else on the comet by the plan view line of matches. There are other incidental 3D matches throughout the 19 parts especially at the end of Part 6 and in Part 18. Part 20 will also corroborate the matches along the south pole (beyond the orange-dotted ‘corner’ in the annotated version of this post’s photo). This will be from a different angle so that will be another ‘twist and turn’ 3D match. Marco has pointed out that the matches are consecutive and constrained, not random. “Aggregated distance from the start point” is just another way of saying “consecutive” and “constrained”. That should have read “at the end of Part 8 and in Part 18” (not Part 6). I think I overstated the case for different perspectives somewhat in the last comment. I was working from memory without looking at the photos. The third photo isn’t from a viewpoint midway between the two others. It appears that way because it’s swiveled from the usual uprighted duck configuration. It’s actually nearer to the ‘lower’ viewpoint that shows the 90° turn. But it is swung around the body latitudes a little and yet maintains the matches. As for the other two photos (Part 19 upper view and Part 17, lower view) the “30° gentle curve” I mentioned is largely due to the 90° turn being seen in perspective. Nevertheless, the fact that the matches hold up despite this swing is good evidence that they aren’t chance correlations from one perspective that would otherwise disappear when the twists and turns into the 3rd dimension are revealed. In other words, there might have been disparities between the matching lines that were hiding in the depth of frame dimension in the lower viewpoint. If they had been there, they would have been revealed as ugly mismatches in the swing to the more top-down view. But the matches do indeed hold up in the new perspective, showing that they match in the third dimension that’s revealed in the top-down view as well as the two dimensions seen in the lower view. The only place where there is a slight disparity in that gentle curve in the top view is towards the bottom of the match lines before turning the corner at the orange dots. The head lobe match line shows the curve continuing at that point. The body match line doesn’t show a curve at that point- it’s straight despite matching the three stepped sections and several transverse fractures. This simply means that the head lobe would overhang in the middle part of the straight line by 30 metres or so. This would be mostly where the yellow dots are and extending to the orange dots. But this is because the underside of that overhang represents a fracture plane between two well-defined strata layers so it was capable of breaking away while retaining the curved overhang that resembles all the other curved strata layers on the head lobe. This means that if you sat the head down on the body today, the underside of that overhang would be about 50 metres above the surface of Anubis and parallel to it. This 50 metres of missing thickness betrays the next stratum layer down that disappeared from the comet in the form of the missing Anubis slab. That’s why there’s a shadow all the way along that part of the body match- there’s a 50-metre cliff there. The Anubis slab hasn’t had its own post yet. I only say this because what would appear to be a difficult conundrum now will appear obvious when we look back from the future. At that point in the future we will have so much more conclusive evidence to know some truths, but at the same time, we will realise that the correct theories and models had all the information right in front of our noses if we bothered to look at it in the right way. It is hard to focus on something that is so close to the front of our nose. What beautiful images,space its my dream. Wow….great and wonderful images of the comet !!!! And now…”.calls to home ” Philae !!!!! 31 Jan 3 Feb 6 Feb 9 Feb 25 Feb ?? Thanks Emily and Bill. That particular perspective shows a totally integrated body and head, which just happens to be ‘trenched’ at the neck. We have observed enough pictures of the jets and their development now to know that they are extremely important and significant. This should cause the investigation to focus on them as a priority if not exclusively. Perhaps it has behind the scenes in which case may we have some results relating directly to the nature and properties of the jets.